A walk on to some of the lesser known hills in the environs of Malham Tarn including Black Hill, Great Close Hill and Abbot Hills. After a heavy couple of weeks at work I wanted a long weekend so having taken the Monday off it was a case of seeing what the weather was like and deciding where to go for a walk. 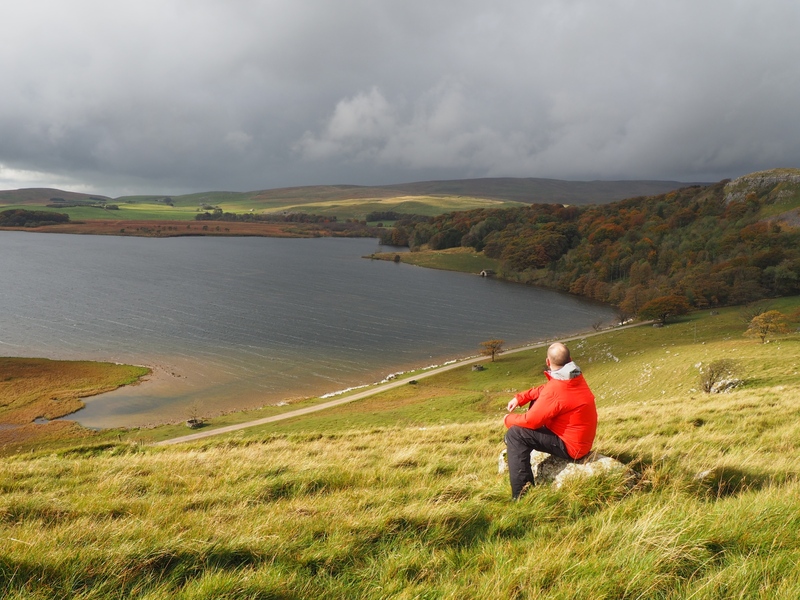 In the end I decided on this walk, an extended ramble around the Malham Tarn area so that I could finally bag Black Hill, the last remaining 400m+ summit in the Yorkshire Dales that I hadn’t visited. The forecast was for sunshine and occasional showers though there was precious little sign of the former when I arrived at the small car park near Malham Tarn. From the car park I took the bridleway signposted for Langscar Gate, a pleasant green path passing below Locks Scar. Upon reaching the gate I crossed the road and took the Gorbeck byway. The first time I’d trodden this track was back in 2005 when it was a complete mess thanks to off road vehicles, it has since been restored and is much better underfoot. Unfortunately, for a bovinephobe like me, there was also a lot of cattle spread out along the path and so I made a few detours off the path to avoid walking through them. At a muddy gate the track passed to the south of Black Hill so I left the path and instead followed the wall on my right which led me to within a few minutes of the summit. Sadly the weather hadn’t improved and so the views from the unmarked top were restricted by low cloud over the higher fells to the north and south. Still I could at least see Smearsett Scar to the west and Malham Tarn to the east. Descending north from Black Hill I picked up a path which led me on to the Malham Tarn – Stainforth road just below Capon Hall. An easy walk on this quiet country lane finally led me to the Malham Tarn Nature Reserve where I made a slight detour on to the duckboards skirting Tarn Moss. There were plenty of signs warning people to stay on the duckboards and from what I could see it was definitely good advice as the ground either side was extremely wet and criss-crossed with narrow channels of water. The duckboards led me to the access road to Malham Tarn House. A short distance along this I again turned off the path to visit the bird hide. There were no birds to be seen so I sat with my back to a tree on the lakeshore to have some lunch. It was at this point that the sun finally began to break through the cloud and suddenly the autumn colours were illuminated quite beautifully. After lunch I returned to the track and walked past the Field Centre and out through the woods on to the open track passing below Great Close Scar. As it has been over eight years since I’d last been to the top of Great Close Hill I decided to head up there so I took a thin path slanting to the north of the impressive scar. Turning around I enjoyed a stupendous view of Malham Tarn made all the more dramatic by the patches of sunlight backed by dark cloud. Having reached the ancient cairn on the top of Great Close Hill I stopped for a while to soak up the scenery and watch as the sunlight moved slowly across the limestone hills of Parsons Pulpit and Proctor High Mark to the east. Eventually I dropped down to the path passing below the eastern side of the hill and walked past the long thin tarn at Great Close Mire and up on to the road over Malham Lings. Walking up the road a short way I then detoured up on to the unassuming summit of Abbot Hills, a mere few minutes walk away. As with Black Hill the highest point was unmarked by a cairn but it did have a good view of the tarn to the north whilst to the south-east there was an interesting prospect of the deep gash containing upper Gordale. To conclude what had been a thoroughly enjoyable walk I followed a nearby wall west to gain a footpath back to the car park. Before leaving I walked up to Tarn Foot to take some more photos on what was now a glorious autumn day. Thanks Neil, glad you liked it. You are right, this really is a cracking autumn in terms of colours. Good work on the duckboards!